I'm not what you'd call a fan of iPad comic reading, so a little background first. Although I am a user of the device itself, and probably couldn't do without my iPad for more than a few hours (it's a sickness), there's just something about reading comic books on it that I can't get used to. And believe me, I tried. When Marvel, DC, and Dark Horse started doing day and date releases, I switched almost exclusively to digital books. 'It's so convenient', I thought. 'I don't even have to go to the store and I won't have comics cluttering up the house', I thought. I was wrong. The bottom line is that I like the feel of a comic- and I even missed the actual act of going to the comic book store and shopping the racks. When I saw Madefire, I thought it was just another reader (like Comixology) that I could easily dismiss. Why would I need another one of those? Wrong again. 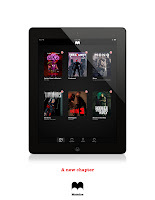 Madefire actually is a motion comic reader. Keep reading- The App is a storefront for brand new, original titles written and penciled by many folks that you know (Dave Gibbons ring a bell?). It's also one of the most original reading experiences I've ever seen. “Madefire allows creators to bring the excitement and intensity of comics and graphic novels to iPad in a truly interactive format,” says Liam Sharp, Chief Creative Officer of Madefire. “We have seen these great innovations in other forms of entertainment such as gaming, movies and television, but reading has largely transferred words to the digital page without transforming the experience.” The Madefire executive team boasts an elite roster of technology and storytellingveterans with the passion and expertise to change the way we create and consume stories. Madefire was founded in 2011 by Ben Wolstenholme, CEO of Moving Brands, Liam Sharp, Chief Creative Officer at Madefire and a veteran comic book writer and artist, and Eugene Walden, CTO at Madefire and a seasoned technology entrepreneur and mobile pioneer. The team is also joined by creative superpowers Dave Gibbons, co-creator of Watchmen, the best-selling graphic novel of all-time, and Bill Sienkiewicz, widely recognized as one of the greatest innovators in the history of sequential art. And here's a sneak peek at Mr.Gibbons' first work for the company- Treatment. And here's what he means by that- you can publish your own books with Madefire. The company will soon be making their publishing suite available through madefire.com for aspiring creators who are looking to put their own graphic novels and/or comic series together. But that's in the future, here's a rundown of the comics and preview issues you'll find on the App itself right now (and all of them take advantage of the iPad's gyroscope, accelerometer, and retina display). Grab Madefire here on the App store.